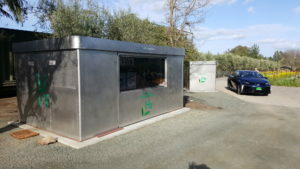 Our third offering in this class of fueling station can be see on the home page in the scrolling pictures at The Ohio State University Center for Automotive Research and below at Stone Edge Farms Micro Grid In Sonoma California. This is a 2 part system housed in MRE’s two specially designed and ventilated stainless steel enclosures. The first enclosure is 14 ft by 9 ft and houses our 330 TT or 342 TT model electrolyzer with twin boosters and the purification system and is capable of producing up to 12 kilograms per day provided you have the maximum input power for 24 hours. The second enclosure is 5.5 ft by 5.5 ft square and houses 24 kilograms of storage at 6,000 psi and the J-2600 fueling dispenser with our proprietary fueling system and fixed orifice the same as the Model 100 and 200 units. Both Enclosures logic systems are networked together and fire and leak detection systems in both enclosures will shut down systems and provide audible and text warnings if triggered. The Model 300 as pictured right, gives production of hydrogen by our 330 TT or 342 TT proprietary alkaline water electrolysis system at 48 kilowatt hours per kilogram, (Patent #US8,465,629 B2 issued June 18th 2013) and makes 12 Kilograms per day of 99.5 purity hydrogen out of the stacks at max input power for 24 hours. System has achieved a Certificate of Attestation to CSA Group IR 3-18. Designed for refueling of fuel cell cars at home or business and fuel cell forklifts, this Renewable Hydrogen Fueling Station does all 5 of the things, (Hydrogen Production, Purification, Compression, Storage and dispensing) that are needed for hydrogen fueling infrastructure all inside two ventilated stainless steel enclosures enclosures. Hydrogen is purified up to 99.995% hydrogen purity with our proprietary palladium based O2 scrubber and desiccant dryers. Hydrogen is Compressed with twin hydrogen boosters to 6,000 psi. The smaller enclosure dispenses thru our proprietary fixed orifice flow control system and a standard J-2600 nozzle. The system has four single phase plugs that run all the systems and needs single phase AC 220 volt with four 60 amp breakers to run all systems on board. It can work with wind, solar or grid electricity. Our own proprietary power supplies and automation systems provide the correct power requirements to the system from your lines. Many automation and safety features are monitored by a programmable interface including our proprietary hydrogen leak detection, purity and fire monitoring systems. All of these are managed by the mechanical Watch Dog disconnect and backed up redundantly by the programmable logic controller . All systems can also be equipped for extra cost with additional systems to allow for a 700 bar ambient temperature communications pressure equalization fill with a fixed orifice, or a slow fill by a higher pressure booster after the initial fill by the 35 MPa or 350 bar system.